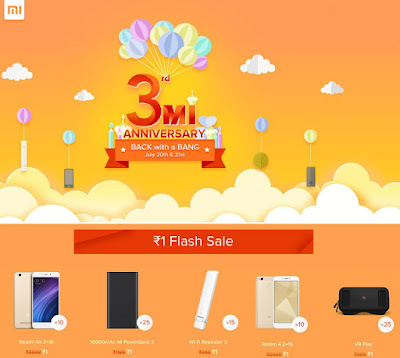 Xiaomi will hold its third Mi anniversary sale on July 20 and 21 in India. In the sale it will have Re. 1 flash sale, sell devices and bundles at a reduced price, allow you to grab discount coupons, bid and win devices and also play The Big Chase Sale to win prizes. Xiaomi will hold Re.1 flash sale every day at 11 AM and 1 PM during the sale. This would allow you to get Redmi 4A, 10000mAh Mi PowerBank 2, Wi-Fi Repeater 2, Redmi 4, Mi VR Play headset and Mi Selfie Stick at just Re. 1. The company will also offer Rs. 100 discount on Mi Protect. It has only announced discounts on accessories and not on smartphones this year.